First I wish to thank those who left such encouraging comments on my last post. I appreciate the comments! I am a day late posting because I went for a hike with my husband up Grizzly Peak instead of getting the pictures taken. The day and the views were breathtakingly beautiful. 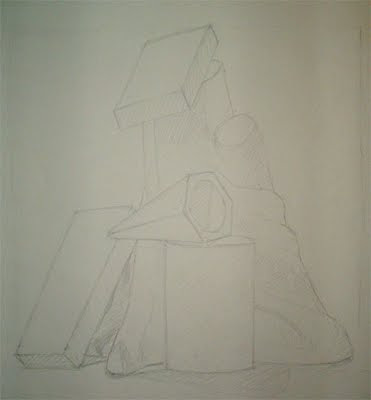 The still life set-ups we are drawing are getting more and more complex. All of us are improving rapidly and are catching many of our own mistakes. The process goes faster and easier, well sort of! I see that Sue at Life Looms Large got to see the documentary "Who Does She Think She Is?" I am envious as there is no screening within a few hundred miles of me. I have contacted the Ashland Independent Film Festival about the movie and I got a nice e-mail saying they will look into it. I would love to have it come here and I think there would be others interested as well. Theresa, any suggestions? I have been following the progress of the screenings online with updates and all. So, here are two drawings from this week. The second one is very light at hard to photograph and therefore see. I think all of us had fun drawing the second one. The teacher put that one up to force us into seeing abstract shapes. The first drawing was interesting to draw too. 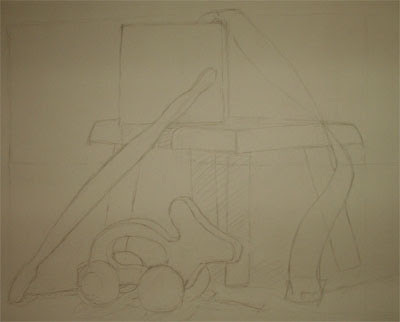 The gesture sketching on Friday went well and for the construction drawing we drew a watering can. It only took us an hour and a half so those of us who stayed until the bitter end got to construct another drawing. I have a special treat this week. The Ashland Academy of Art was featured in a local TV program that is also online. They give a tour of the school and talk about what it takes to learn and be an artist. You can view that here by clicking on the link. Finally, I have a request for Dana W. The e-mail I have for you is no longer working! Could you please send an email to me with your current address? Thanks Dana! Grizzly Peak - sounds fun as long as you don't actually see any grizzlies!! I was very lucky to be able to see "Who Does She Think She Is?". I'd been subscribed to the email list for a long time, and thought I'd hear if there were local showings. But it just happened that during their push to tell people about some house party showings over the weekend, I checked the website and saw that the movie was playing for a week last week in Concord, NH. A college brought the movie to a local independent theater. So I got to see it finally!! Worth the wait - and keep looking for it. I hope they'll sell the DVD at a regular price sometime soon because I'd like to see it again. Great video on your art school! Thanks for finding it for us. Great links! And while quiet I'e been following your steady progress.